We have all experienced frustration with automatic faucets in public restrooms, even those of us who work for a company that has designed more than a few motion sensing products. 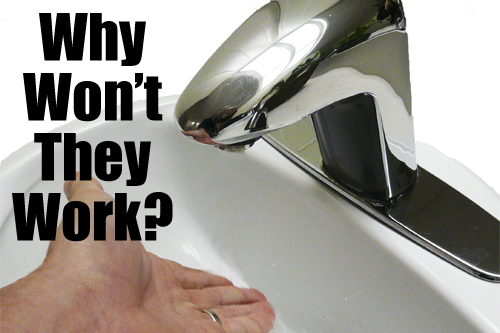 So what’s up with that, and is there anything you can do to get those faucets to work? First it helps to understand how these kinds of devices operate. Somewhere on the faucet is a sensor that usually sits behind a dark lens, similar to the lens on the end of your TV remote. The sensor on the faucet actually works quite a bit like your TV and remote control, sending out an invisible infrared signal, and receiving that signal when it is reflected by your hands. Depending on the design, the sensor could be looking for several different things. Some just measure how close you are to the sensor, while others require that the return signal be regularly changing, expecting that you are moving you hands while using the faucet. Some motion activated faucets also include a short timer, so once activated it will run for a certain time before shutting off. Some faucets allow the installer to make adjustments to the sensor as well. If the owner of the restroom facilities is particularly environmentally aware, or highly cost conscious, they may set the units to run for the shortest possible time or require a very strong reflected signal before they will operate. Sometimes these features can be abused, making life difficult for those of use just trying to wash our hands. Check for water droplets in the sink: If you don’t see any move on to the next sink. That tells you that others before you have tried to activate the faucet and have failed. Locate the sensor: Look for the dark colored lens, which is usually in the stem of the faucet, on the end of the faucet, or facing somewhat downward into the sink. Knowing where the sensor is helps you position your hands to activate it. Provide a good reflection: Place you hand in a way that maximizes the reflection back to the sensor. Think of your hand as if it were a mirror; the more reflection you provide the more reliably the sensor will activate. Be patient: To conserve power the senor may only be looking for signals a few times a second. This can make the faucet seem unresponsive since waiting that half second feels pretty slow. Move closer to the sensor: Sometimes these darned things are just set up with too short a range. It may even be that you have to wash one hand at a time and use one to keep the sensor activated. Be even more patient: Some manufactures require a “time-out” after the faucet is activated to prevent a false trigger that could causes the faucet to run continuously. If you know where the sensor is, pull your hands away momentarily, then put them in front of the sensor again and wait. Chances are it will turn back on after a few seconds. All that said, it most motion sensing fixtures on the market are far from bullet-proof. I think many could use more design work. As a product developer, I would be disappointed if my design didn’t work flawlessly 99.9% of the time. While they really shouldn’t require you to learn tricks to make them do their job, I hope these tips we’ve provided will help you get water from those uncooperative IR faucets while we wait for them to finally build a better one.